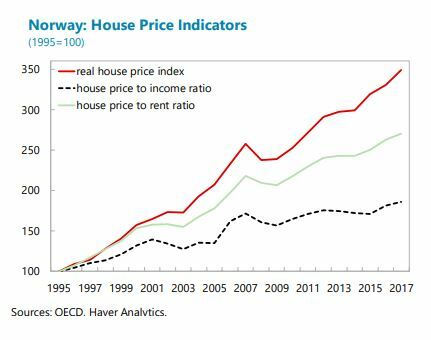 “House prices in Norway have been growing rapidly in recent years. As of May 2018, nationwide house prices were 55 percent higher than in 2010. The national house price to income ratio remains historically and internationally high. Although house prices fell in 20172— particularly in Oslo, which saw nominal house price declines of 10.5 percent—the correction was short lived. House prices rose again by 7.5 percent during January to May of 2018 on a seasonally-adjusted basis. There has been a significant regional divergence of house price trends since 2013. Real house prices in Oslo now stand 60 above their 2010 level—compared to 35 percent for the whole of Norway. 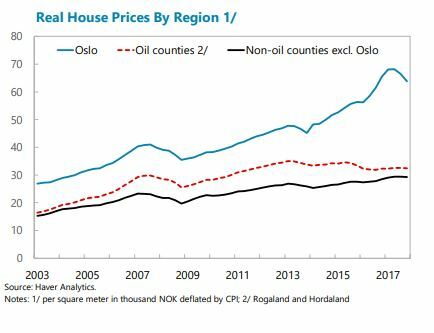 House prices in Oslo have been increasing particularly quickly compared to other regions since 2013. This represents a contrast to the last period of rapid house price appreciation—before the global financial crisis—when house prices grew evenly across Norway. Large differences in house prices across regions can have macroeconomic implications. There is growing evidence that large house price differentials can limit regional labor mobility, thus slowing income and productivity convergence (Ganong and Shoag, 2015; Hsieh and Moretti, 2017). House price differentials—to the extent they translate into higher household debt and debt servicing costs—can make some local economies more sensitive to abrupt house price corrections than the others, thus providing arguments in favor of region-specific rather than nation-wide policies to mitigate financial vulnerabilities.